by Alfred R. Wallace, LL.D. VACCINATION HAS NOT DIMINISHED SMALL-POX. ANNUAL DEATHS IN ENGLAND PER MILLION LIVING. HAVING been led to enquire for myself as to the effects of Vaccination in preventing or diminishing Small-pox, I have arrived at results as unexpected as they appear to me to be conclusive. The question is one which affects our personal liberty as well as the health and even the lives of thousands; it therefore becomes a duty to endeavour to make the truth known to all, and especially to those who, on the faith of false or misleading statements, have enforced the practice of vaccination by penal laws. (1. )-That during the forty-five years of the Registration of deaths and their causes, Small-pox mortality has very slightly diminished, while an exceedingly severe Small-pox epidemic occurred within the last twelve years of the period. (2. )-That there is no evidence to show that the slight decrease of Small-pox mortality is due to vaccination. (3. )-That the severity of Small-pox as a disease has not been mitigated by vaccination. (4.) -That several inoculable diseases have increased to an alarming extent coincidently with enforced vaccination. The first, second, and fourth propositions will be proved from the Registrar-General's Reports from 1838 to 1882; and I shall make the results clear and indisputable, by presenting the figures for the whole period in the form of diagrammatic curves, so that no manipulation of them, by taking certain years for comparison, or by dividing the period in special ways, will be possible. The diagrams show, in each case, not the absolute mortality but the deaths per million living, a method which eliminates the increase of population and gives true comparative results. The first thing clearly apparent in this diagram, is the very small diminution of Small-pox corresponding with the epochs of penal and compulsory vaccination; while the epidemic of 1871 was the most destructive in the whole period. The average diminution of Small-pox mortality from the first to the second half of the period, is 57 deaths per million per annum. Looking now at the upper curve, we see that the mortality from the chief zymotic diseases has also decreased, [From 1838 to 1853, the average Small-pox death-rate exceeded that of the years 1854 to 1867 by 229 per million living. But the average of the years 1868 to 1886, exceeded that of the years 1854 to 1867 by 46 per million] more especially during the last 35 years; but the decrease of these diseases is not, proportionally, so great, owing to the fact that deaths from Diarrhoea have considerably increased in the latter half of the period. On the other hand, Typhus and Typhoid fevers have diminished to a much greater extent than Small-pox, as shown by the dotted line on the diagram, the reduced mortality ,from this cause alone being 382 per million, or more than six times as much as that from Small-pox. 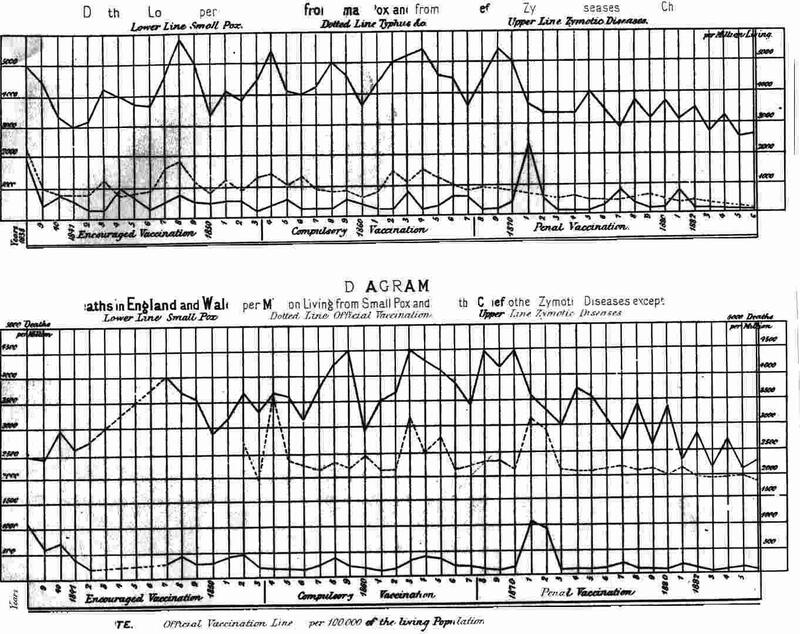 Every one will admit that this remarkable decrease of Typhus, &c., The deaths from Typhus, [Enteric, and Fever, 1871-80, were less by 540 per million than in the ten preceding years. The years 1881 to 1886 show a further reduction, as compared with 1871 to 1880, of 125 per million living.  ED.] is due to more efficient sanitation, greater personal attention to the laws of health, and probably also to more rational methods of treatment. But all these causes of amelioration have certainly had their effect on Small-pox; and as the mortality from that disease has not equally diminished, there is probably some counteracting cause at work. So far, therefore, from there being any proof that vaccination has diminished Small-pox in London, the tendency of the Registrar-Generals facts, (and there are no other facts which are trustworthy,) is to show that some counteracting cause has prevented general sanitation from acting on this disease as it has acted on Typhus, and that cause may, possibly, be vaccination itself. MR. MARSON, the Surgeon of the Small-pox Hospital, told the Select Committee, 1871, answer 4,190 :" The public are pretty largely vaccinated now, and will be more so every year, I should think as time goes on. There is one point which has not been very clearly brought forward this morning, and that is the increase of Small-pox after vaccination year after year. When I first went to the hospital, 35 years since, from 1835 to 1845, the admission of patients into the Small-pox hospital was 44 per cent, of Small-pox after vaccination; from 1845 to 1855, 64 per cent. ; from 1855 to 1865, 78 per cent. ; and during 1863 and 1864, 83 and 84 per cent. Those are patients who have been vaccinated." Thc line of official vaccination in the diagram, shows that Mr. MARSON was mistaken as to the amount of public vaccination, and that it was a larger incidence of Small-pox among the vaccinated he was witnessing; not the result of extension of vaccination.ED. A temporary increase in the number of vaccinations always takes place during an epidemic of Small-pox, or when an epidemic is feared; but an examination of the curve of vaccination does not support the statement that it checks the epidemic. On careful inspection it will be seen that on three separate occasions a considerable incease in vaccinations was followed by an increase of Small-pox. Let the reader look at the Diagram, and note that in 1863 there was a very great number of vaccinations, followed in 1864 by an increase in Small-pox mortality. Again, the number of vaccinations steadily rose from 1866 to 1869, yet in 1870-71 Small-pox mortality increased; and yet again, in 1876 an increase in vaccinations was followed by an increase of Small-pox deaths. In fact, if the dotted line showed inoculation instead of vaccination, it might be used to prove that inoculation caused an increase of Small-pox. I only maintain, however, that it does not prove that vaccination diminishes the mortality from the disease. During the panic caused by the great epidemic of 1871-2, vaccinations rose enormously, and declined as rapidly the moment the epidemic passed away, but there is nothing whatever to show that the increased vaccinations had any effect on the disease, which ran its course and then died out like other epidemics. (I. )That Small-pox has not decreased so much or so steadily as Typhus and allied fevers. (2. )That the diminution of Small-pox mortality coincides with a diminished, instead of an increased efficiency of official vaccination. (3. )That one of the most severe epidemics of Small-pox on record, within the period of accurate statistics, occurred after 33 years of official, compulsory, and penal vaccination. These three groups of facts give no support to the assertion that vaccination has diminished Small-pox mortality; and it must always be remembered that we have actually no other extensive body of statistics on which to found our judgment. The utility or otherwise of vaccination is purely a question of statistics. It remains for us to decide, whether we will be guided by the only trustworthy statistics we possess, or continue blindly to accept the dogmas of an interested and certainly not infallible body of professional men, who once upheld inoculation as strongly as they now uphold vaccination. SMALL-POX HAS NOT BEEN MITIGATED BY VACCINATION. It is often asserted that, although vaccination is not a complete protection against Small-pox, yet it diminishes the severity of the disease, and renders it less dangerous to those who take it. This assertion is sufficiently answered by the proof above given, that it has not diminished Small-pox mortality; but more direct evidence can be adduced. The best available records show that, the proportion of deaths to Small-pox cases is the same now, although a large majority of the population are vaccinated, as it was a century ago before vaccination was discovered. DR. JURIN, in 1723; the London Small-pox Hospital Reports, 1746-63; DR. LAMBERT, 1763 ; and REES Cyclopedia, 1779; give numbers varying from 165 to 253 as the per-centage of mortality among Small-pox patients in hospitals ;  the average of the whole being I8.8 percent. Now for the epoch of vaccination. MR. MARSON, 1836-51, and the Reports of the London, Homerton, Deptford, Fulham, and Dublin Small-pox Hospitals, between 1870 and 1880, give numbers varying from 14.26 to 2I.7 as the deaths per cent. of Small-pox patients, the average being 18.5. And this, be it remembered, under the improved treatment and hygiene of the nineteenth as compared with the eighteenth century. These figures not only demonstrate the falsehood of the oft-repeated assertion that vaccination mitigates Small-pox, but they go far to prove the very oppositethat the disease has been rendered more intractable by it; or how can we account for the mortality among Small-pox patients being almost exactly the same now as a century ago, notwithstanding the great advance of medical science and the improvements in hospitals and hospital treatment ? [The following authorities have been examined for the facts and figures of this section.
. by the Bishop of Lincoln. London, 1763." REES Cyclopedia, 1779, Vol 2, Art. INOCULATION Col. INP. par. 5, (extract). "From a general calculation it appears that, in the hospitals for Small-pox and Inoculation, 75 die out of 400 patients having the distemper in the natural way." Total cases before Vaccination, 24,994. London Hospitals, 1870-72, (14,808 cases); in the Report of a Committee of the Managers of the Metropolitan Asylum District, July 1872, p. 5. London Hospitals, 1876-80, (15,172 cases); in a letter to The Times of November 8th, 1879, from W. F. JEBB, Clerk to the Metropolitan Asylum District. Homerton, (5,479 cases); from the Report of the Committee, 1877. Deptford, (3,185 cases); from the Report of the Medical Superintendent, 1881. Fulham, (1,752 cases); from the Report of the Medical Superintendent, 1881. Dublin, (2,404 cases); from the Annual Report of the Committee, 1880. Total cases after Vaccination, 48,451. The extracted figures and per-centages have been all carefully verified, and the averages have been obtained by dividing the total number of deaths multiplied by 100, by the total number of cases. Here we have a crucial test of the efficacy or uselessness of vaccination. Our Soldiers and Sailors are vaccinated and re-vaccinated in accordance with the most stringent official regulations. They are exceptionally strong and healthy men, in the prime of life, and if Vaccination is of any use, Small-pox should be almost unknown among them, and no soldier or sailor should ever die of it. They are in fact often spoken of as a "perfectly protected population." Now let us see what are the facts. A Return has been issued to the House of Commons, "Small-pox (Army and Navy)," dated "August, 1884," giving the mean strength, the number of deaths from Small-pox, and the ratio per thousand in each service for the twenty-three years 1860-82. An examination of this Return shows us that there has not been a single year without two or more deaths in the Army, and only two years without deaths in the Navy. Comparing the Return on "Vaccination, Mortality, No. 433, issued by the House of Commons in 1877, we find that, in the twenty-three years 1850-72, (the latest there given,) there were many years in which no adult Small-pox deaths were recorded for a number of large towns of from 100,000 to 270,000 inhabitants. Liverpool had none in 3 of the years, Birmingham and Sunderland in 7, Bradford and Sheffield in 8, Halifax in 9, Dudley in 10, while Blackburn and Wolverhampton were each totally without adult Smallpox mortality for 11 out of the 23 years! It is true that the cases are not strictly comparable, because for these towns we have only deaths of persons aged 20 and upwards given separately, whereas the ages of the Army and Navy range chiefly from about 17 to 45. But, considering the extremely unsanitary state of many of these towns, and their great preponderance in freedom from Small-pox, there is clearly no room left for the alleged effect of revaccination in securing to our soldiers and sailors immunity from the disease. In the General Report of the last Census, Table 14, p. 89, the numbers of males at successive ages are given for the three last Censuses1861, 1871, and i88t. By a simple calculation it is found that the number of males of all ages is to that of males aged K 555 in the proportion of 1 to .528. Table 4. p. 78, of the same Census Report, gives the male population for the middle of each of the 23 years included in the Army and Navy Return. The mean of these numbers is 11,167,500; and this sum, multiplied by the factor .528, gives 5,896,500 for the average male population of the ages 1555 for those years. From the tables of "Causes of Death at different Periods of Life" in the twenty-three successive Reports of the Registrar-General, 1860-1882, I have extracted the deaths from Small-pox of males aged 1555, the mean annual value of which is 1,041 ; and this number, divided by the number of millions in the corresponding population (5.8965), gives the death-rate per million = 176. The limit of age, 1555, has been taken because the General Report of the Census of 1881, Table 40, gives, for the Army and Navy, 7,530 men over 45, and 28,834 under 20 years of age. The general mortality of the Navy from disease appears (from the Registrar-Generals Report, 1882, Tables 59 and 65,) to be considerably less than that of the Army, so that the greater mortality from Smallpox must be due to some special conditions. But whatever these are, the conditions of the civil population are certainly much worse. Two thirds of the families inhabiting Glasgow live in houses of one or two rooms only, and many other towns, including London, are probably not much better. Under such conditions, and with the low vitality induced by insufficient food, over work, and bad air, we should expect the Small-pox mortality of our civil population to be very much greater than that of the picked class of sailors who enjoy ample food, fresh air, and medical attendance. Where then is the alleged "full security" afforded by re-vaccination, and how are we to characterise the statements circulated at the expense of the public, that "Small-pox is almost unknown in the Army and Navy?" [The following are a few of these assertions. The italics are to call attention to the essential words of each statement. The "Lancet," of March 1st, 1879, says :"Vaccination needs to be repeated well once in a lifetime, and then the immunity is almost absolute." In the tract on "Small-pox and Vaccination" issued by the National Health Society, and now being widely circulated at the expense of the ratepayers, with the sanction of the Local Government Board, we find this statement :" Every Soldier and Sailor is re-vaccinated; the result is that Smallpox is almost Unknown in the Army and Navy, even amid surrounding epidemics." If we are to draw a legitimate conclusion from the facts, it is, that the re-vaccination to which our soldiers and sailors are subjected, renders Small-pox more fatal when it attacks them, for thus only can we explain the large mortality among picked healthy men under constant medical supervision, and living under far better sanitary conditions than the mass of the civil population. *These figures have been thus obtainedthe Registrar-Generals Summary, 1882, (Table 7, p. xv.) gives the Small-pox deaths per 1,000, for twenty great Towns, for the years 1872-82. The Parliamentary Return, "Vaccination, Mortality," 1877, gives the Small-pox mortality and population of a considerable number of towns for the years 1847-72. From these two official papers the Small-pox mortality per million of the whole male population from 1860 to 1882, for such towns as occur in both the tables, is easily obtained. The average Small-pox death-rate for all England is found to be 211 ~7, while that of the ages 1545 is 176. These numbers are in the proportion of 1 to .83; hence the total Small-pox mortality of any town multiplied by the factor .83 will give, approximately, the mortality at ages 1545. The proportion has been obtained from males only, but that of the two sexes combined will not be materially different. Of course there are many other towns which have a much higher mortality, but very few are much worse than the Navy. The very worst large town which I can find in the Reports is Newcastle-on-Tyne, which for the same period had an adult Small-pox mortality of 349 per million. But the fact that five of our most populous towns have considerably less adult Small-pox mortality than the Navy, and one of them but little more than the Army, amounts to a demonstration of the uselessness of the most complete re-vaccination. The general mortality of our adult population is much greater than that of the Army and Navy. From the official sources of information already quoted, I find that the average mortality of the adult male population of England, of the ages 1555, for the years 1860-82, was about 11,300 per million. That of the Navy, for the same period, was 11,000 per million from all causes, and only 7,150 from disease. That of the Army, at home, was 10,300 per million. Abroad it was nearly double (19,400), but this included all the deaths from casualties, exposure, &c., in the Abyssinian, Afghan, Zulu, Transvaal, and other petty wars. Thus the superior physique of our soldiers and sailors, together with the sanitary conditions under which they live, are fully manifested in a mortality from disease much below that of the adult civil population of comparable ages. If we make the same allowance for the influence of these causes in the case of Small-pox, there remains absolutely nothing for the alleged protective influence of re-vaccination. Surely we shall now hear no more of the re-vaccinated nurses in Small-pox hospitals, (as to whom we have no statistics, but only vague and usually inaccurate assertions,) when we have a great, officially recorded experiment to refer to, extending over 23 years and applied to more than 200,000 men, the results of which directly contradict every professional and official statement as to the safeguard of re-vaccination. VACCINATION ITSELF A CAUSE OF DISEASE AND DEATH. As has been now shown, vaccination is quite powerless either to prevent or to mitigate Small-pox. But this is not all, for there are good grounds for believing that it is itself the cause of much disease and serious mortality. But there is also good reason to believe that many other blood-diseases are transmitted and increased by the same means, since there has been for many years a steady increase of mortality from such diseases which is terrible to contemplate. The following table gives the increase of five of these diseases from the Registrar-Generals Annual Report for 1880, (page lxxix., Table 34,) and it is very noteworthy that, in the long list of maladies there tabulated, no others, (except Bronchitis, which often follows vaccination though not, probably, transmitted by it,) show any such striking and continuous increase, while the great majority are either stationary or decreasing. *This Table has not been continued in later Reports; but we find that Cancer (the only disease of the five separately tabulated) goes on steadily increasing, the mortality for the five years, 1881-85, being given in the 48th Report as follows :Syphilis, 92; Cancer, 544. Small-pox, for the same period was 78.ED. We here see a constant increase in the mortality from each of these diseases, an increase which in the sum of them is steady and continuous. It is true, we have not, and cannot have, direct proof that vaccination is the sole cause of this increase, but we have good reason to believe that it is the chief cause. In the first place it is a vera causa, since it directly inoculates infants and adults, on an enormous scale, with whatever blood-disease may exist unsuspected in the system of the infants from whom the vaccine virus is taken. In the next place, no other adequate cause has been adduced for the, remarkably continuous increase of these special diseases, which the spread of sanitation, of cleanliness, and of advanced medical knowledge, should have rendered both less frequent and less fatal. * It has been boldly asserted by the Government Department controlling vaccination, [Eleventh Report of the Medical Officer to Local Government Board, p. vi., et seq.,] that even if some children are killed by vaccination, 12,000 lives are annually saved by it. The basis of that assertion is an estimate which contradicts the official vaccination returns at almost every point. The estimate and assertion are false to the facts which are obtainable. The above noted estimate is taken to prove that 94 per cent. of London children under ten years of age are vaccinated, and that 95 per cent. of the population [p. 41] are vaccinated. This statement is further assumed to be supported by an examination of "53,185 children in various national, charitable, and parochial schools and workhouses in London." Such is the odious rigour of vaccine regulations in our "national, charitable, and parochial workhouse schools," that I should not have been surprised if, of these children, not one was found unvaccinated The parents of these poor children have had no one to defend them by paying fines for neglect of the vaccination. Yet this "inspection" showed 6 per cent, to have "no vaccination scar," or to be doubtful as to vaccination. It is on such bases, that tremendous statements, such as that noted above, are founded; and to shade off the impudence of this one it is further declared that "the estimate of the number of the unvaccinated is probably too high." Our responsible ministers have been appealed to respecting such a base use of official reports, and have had the humour to refer the objector to the very officials who have so degraded their department of "the public service." These, in turn, when appealed to, refer to the head of the department; meanwhile the false statement is repeatedly quoted, and stands as first used. The Reports of the Local Government Board, show that only once have there ever been more than 87 per cent. of the births of the country vaccinated, and in London 3 or 4 per cent, fewer. The last year reported, 1886, gives 30,000 fewer official vaccinations than 1877, when it was over 86 per cent. of the births. The plan of the officials is to get 94 per cent, vaccinated, by deducting the infants who died unvaccinated from the total births, and treating the rest as "surviving." I know no more condemnable trick. Death is as busy with vaccinated as with unvaccinated children. ED. Comparative Mortality of the Vaccinated and the Unvaccinated. IN his speech in the House of Commons, June 19th, 1883, SIR LYON PLAYFAIR made the following statement :  "An analysis of 10,000 cases in the Metropolitan Hospitals shows that 45 per cent. of the Unvaccinated patients die, and only 15 per cent. of Vaccinated patients ;" and he further showed that statistics of a similar character had been published in other countries. It will no doubt be objected by my readers that these statistics, if correct, are a complete proof of the value of vaccination; and I shall be expected to show that they are incorrect or give up the whole case. This I am prepared to do; and I now undertake to prove firstly, that the figures here given are unreliable; and, secondly, that such Statistics necessarily give false results unless they are classified according to the age-periods of the patients. THE PERCENTAGES OF VACCINATED AND UNVACCINATED UNRELIABLE. The simple fact of death from Small-pox is easily ascertained, and has been for many years accurately recorded. *As an instance of the reticence of officials on the subject. I cannot find any details in the Registrar-Generals reports respecting vaccinated persons dying of Small-pox until 1874. For that year 270 vaccinated persons are reported dying of Small-pox. Then for years no information is given, until 1879, when it is again inserted. For that and the subsequent years we have 2,512 vaccinated persons returned as dying of Small-pox. Several thousands are noted as "not stated as to vaccination."ED. (I)Infants dying under vaccination age, and who, therefore, have no corresponding class among the vaccinated, but among whom the Small-pox mortality is greatest. (2. )Children too weakly or diseased to be vaccinated, and whose low vitality renders any severe disease fatal. (3. )A large but unknown number of the criminal and nomad population who escape the vaccination officers. These are often badly fed and live under the most unsanitary conditions; they are, therefore, especially liable to suffer in epidemics of Small-pox or other zymotic diseases. It is by the indiscriminate union of these three classes, together with those erroneously classed as unvaccinated owing to the obliteration of marks or other defect of evidence, that the number of deaths registered "unvaccinated" is swollen far beyond its true proportions, and the comparison with those registered "vaccinated" rendered altogether untrustworthy and misleading. This is not a mere inference, for there is much direct evidence that the records "unvaccinated" and "no statement" in the Reports of the Registrar-General are often erroneous. As the chief argument for vaccination rests upon this class of facts, a few examples of the evidence referred to must be here given. "Sometimes persons were said to be vaccinated, but no marks could be seen, very frequently because of the abundance of the eruption. In some cases of those which recovered, an inspection before dismissal discovered vaccine marks, sometimes very good,"
(4. )" The last epidemic of Small-pox which visited vaccinated Preston was in 1877. In February of that year, Dr. Rigby, the medical officer of the Union, sent out a report, in which he stated that out of 83 persons admitted into the Fulwood Small-pox Hospital, 73 were vaccinated. All recovered, he alleged, but the ten unvaccinated cases all died. Here was a bold and specific statement; but what were the facts revealed after careful investigation by two committees? The first case reported as unvaccinated turned out to be a revaccinated policeman, named Walter Egan. Another case reported as unvaccinated was a child named Mary Shorrock, vaccinated by the very medical officer who returned her as unvaccinated. In all, six cases out of the ten were proved to have been vaccinated, whilst three were doubtful, we not being able to trace them. "From letter of Mr. J. SWINDLEHURST, in the Walsall Observer, July 2 1st, 1888.ED. (5.) In 1872, MR. JOHN PICKERING, of Leeds, carefully investigated a number of cases entered as "not vaccinated" by the medical officers of the Leeds Small-pox Hospital, tracing out the parents, examining the patients if alive, or obtaining the certificate of vaccination if they were dead. The result was, that 6 patients, entered as "not vaccinated," and still living, were found to have good vaccination marks; while 9 others who had died, and whose deaths had been registered as "not vaccinated," were proved to have been successfully vaccinated. In addition to these, 8 cases were proved to have been vaccinated, some of them three or four times, but unsuccessfully, and 4 others were certified "unfit to be vaccinated," yet all were alike entered as "unvaccinated." The full particulars of this investigation are to be found in a pamphlet by MR. PICKERING, published by F. PITMAN, 20, Paternoster Row, London. (6. )As further corroborative evidence of the untrustworthiness of all records on the subject emanating from medical men, the following quotation from an article on "Certificates of Death," in the Birmingham Medical Review for January, 1874, is important; the italics are my own :" In certificates given by us voluntarily, and to which the public have access, it is scarcely to be expected that a medical man will give opinions which may tell against or reflect upon himself in any way. In such cases he will most likely tell the truth, but not the whole truth, and assign some prominent symptom of the disease as the cause of death. As instances of cases which may tell against the medical man himself I will mention erysipelas from vaccination, and puerperal fever. A death from the first cause occurred not long ago in my practice, and although I had not vaccinated the child, yet in my desire to preserve vaccination from reproach, I omitted all mention of it from my certificate of death." The illustrative facts now given cannot be supposed to be exceptional, especially when we consider the great amount of time and labour required to bring them to light; and taken in connection with the astounding admissions of medical men, of which examples have been just given, they prove that no dependence can be placed on the official records of the proportions of vaccinated and unvaccinated among Smallpox patients; while, if MR. VACHERS method of registration is usually followed, about 8o per cent. of those classed by the Registrar-General under the heading "no statement" have been really stated, by their parents or friends, to have been vaccinated. OUR HOSPITAL STATISTICS NECESSARILY GIVE FALSE RESULTS. But a still more serious matter remains to be considered, and it is a striking proof of the crude and imperfect evidence on which the important question of the value of vaccination has been decided, that the point in question has been entirely overlooked by every English advocate of vaccination, although it involves an elementary principle of statistical science. The requisite comparison has, however, been made on a population of about 6o,ooo, consisting of the officials and workmen employed on the Imperial Austrian State Railways, by the Head Physician, DR. LEANDER JOSEPH KELLER; and his results during the years 1872-3 are so important that it is necessary to give a brief abstract of them. [Report on Small-pox cases among the Employees of the Imperial Austrian State Railway Company for the year 1873. Translated from the German by MRs. HUME-ROTHERY. National Anti-Compulsory Vaccination League. (1. )It is shown that the death-rate of Smallpox patients is greatest in the first year of life, then diminishes gradually to between the 15th and 20th year, and then rises again to old age; thus following exactly the same law as the general mortality. (2. )The Small-pox death-rate, among over 2,000 cases, was 17.85 per cent. of the cases, closely agreeing with the general average. That of the unvaccinated was 23.2O per cent., while that of the vaccinated was only 15.61 per cent. (3.) This result, apparently so favourable to vaccination, is shown to be wholly due to the excess of the unvaccinated in the first two years of life,* [* This applies to Austria. In England vaccination is usually performed earlier, yet, in a pamphlet entitled "Plain Fads an Vaccination," by G. OLIVER, about 1872, it was stated that in the Small-pox Hospital, Hampstead," The number of the unvaccinated patients, up to the age of ten years, greatly preponderates over the vaccinated of corresponding ages." In the Homerton Small-pox Hospital in the eight years 1871-77, there were 147 unvaccinated patients under 2 years old, to 20 vaccinated, including among these the doubtful cases.] and to be a purely numerical fact entirely unconnected with vaccination. This is proved as follows :Taking, first, all the ages above 2 years, the death-rates of the vaccinated is 13.76, and of the unvaccinated 13.15, almost exactly the same, but with a slight advantage to the unvaccinated. Thus the Small-pox death-rate is actually less for the unvaccinated than for the vaccinated in infants, and equal for all the higher ages; yet the average of the whole is higher for the unvaccinated, simply on account of the greater proportion of the unvaccinated at those ages at which the mortality is universally greatest. It is thus made clear that any comparison of the Small-pox mortality of the vaccinated and the unvaccinated, except at strictly corresponding ages, leads to entirely false conclusions. This curious and important fact may perhaps be rendered more easily intelligible by an illustration. Let us take the whole population up to 20 years of age, and divide it into two groupsthose who go to school, and those who do not. If the Small-pox mortality of these were separately registered, it would be found to be very much greater among the non-school goers,composed chiefly of infants, and of children too weakly to be sent to school, amongst whom the mortality is always very great, so much so that a doctor of wide experienceDR. VERNON, of Southporthas stated that, he had never known an infant under one year of age recover from Small-pox. But we should surely think a person either silly or mad who argued from such statistics that school-going was a protection against the disease, and that school children formed a "protected population." Yet this is exactly comparable with the reasoning of those who adduce the greater mortality among unvaccinated Small-pox patients of all ages and conditions, as the very strongest argument in favour of vaccination! Good statistics [It must be insisted upon, over and over again, that they are not good statistics, where the class under trialthe vaccinatedare in great numbers of cases assumed not to be vaccinated against all testimony available.ED.] and good arguments cannot be upset, or even weakened, by those which are bad. I have now shown that the main argument relied on by our adversaries, rests on thoroughly unsound statistics, inaccurate to begin with, and wrongly interpreted afterwards. Those which I have used, on the other hand, if not absolutely perfect, are yet the best and most trustworthy that exist. I ask statisticians and men of unbiassed judgment to decide between them. (I. )-Vaccination does not diminish Smallpox mortality, as shown by the 45 years of the Registrar-General's statistics, and by the deaths from Small-pox of our "re-vaccinated" soldiers and sailors being as numerous as those of the male population of the same ages of several of our large towns, although the former are picked, healthy men, while the latter include many thousands living under the most unsanitary conditions. (2. )-While thus utterly powerless for good, vaccination * is a certain cause of disease and death in many cases, and is the probable cause of about 10,000 deaths annually by five inoculable diseases of the most terrible and disgusting character, which have increased to this extent, steadily, year by year, since vaccination has been enforced by penal laws! *the operation itself kills many. the registrar-General gives, under the heading of Cow-pox and other effects [erysipelas, &c.] of vaccination for the years 1881-1886, the following deaths of infants under one year. In the country, 255 deaths. In London, 61. Total for 6 years, 316.--ED. (3. )-The hospital statistics, showing a greater mortality of the unvaccinated than of the vaccinated, have been proved to be untrustworthy; while the conclusions drawn from them are shown to be necessarily false. If these facts are true, or anything near the truth, the enforcement of vaccination by fine and imprisonment of unwilling parents, is a cruel and criminal despotism, which it behoves all true friends of humanity to denounce and oppose at every opportunity. Such legislation, involving as it does, our health, our liberty, and our very lives, is too serious a matter to be allowed to depend on the misstatements of interested officials or the dogmas of a professional clique. Some of the misstatements and some of the ignorance on which you have relied, have been here exposed. The statistical evidence on which alone a true judgment can be founded, is as open to you as to any doctor in the land. We, therefore, demand that you, our representatives, shall fulfil your solemn duty to us in this matter, by devoting to it some personal investigation and painstaking research; and if you find that the main facts as here stated are substantially correct, we call upon you to undo without delay the evil you have done. WE, THEREFORE, SOLEMNLY URGE UPON YOU THE IMMEDIATE REPEAL OF THE INIQUITOUS REPEAL LAWS BY WHICH YOU HAVE FORCED UPON US A DANGEROUS AND USELESS OPERATION-AN OPERATION WHICH HAS ADMITTEDLY CAUSED MANY DEATHS, WHICH IS PROBABLY THE CAUSE OF GREATER MORTALITY THAN SMALL-POX ITSELF, BUT WHICH CANNOT BE PROVED TO HAVE EVER SAVED A SINGLE HUMAN LIFE. IN addition to other difficulties besetting the students of our Hospital records, one stands prominently forward as exceeding the others. DR. WALLACE has referred to the difficulty of comparing vaccinated with those called un-vaccinated, who are a mixed class, often not even classed in age together. But a greater omission must be complained of. The only correct way of classing Small-pox patients is by age and by eruption. The eruption, or the state of the skin, is the only scientific guide to the nature of the disorder. One kind of Small-pox is so mild, that even bad nursing can hardly kill the patientanother kind so fatal, that not the best nursing and greatest skill can cure it. As a rule these two kinds are lumped together without any distinction, and even when given they are not often divided into vaccinated and un-vaccinated. In general summaries this classification is universally disregarded. The Metropolitan Hospitals have been in operation since 1869. During the 16 years reported upon to the managers, since that time they have received 53,579 cases of Small-pox for treatment. Of this great total, no fewer than 41,061 are classed as vaccinated, 5,866 unvaccinated, and the remainder as "doubtful." The fatality of the un-vaccinated and doubtful is very heavy, but this is largely due to considerations as to the people who are the unvaccinated, which have already been urged, and which are greatly strengthened by facts now to be adduced. The Handbook, 1887, giving these particulars, has no "doubtful" class until 1880. Before that period the un-vaccinated absorbed them all. As to this doubtful class! Why are there any doubts in the classification? The answer is that the vaccination marks are on the skin, and the skin is the part of the patient most affected in the very bad cases. In the mild cases the skin does not suffer much. The vaccination marks are clearly visible. And so the "good" marks of vaccination will most certainly be most numerous in the mild cases. But in the confluent cases the skin is badly affected. The pustules run together, and if this eruption is over the vaccinated arm, no vaccination mark can be seen. But no case is recorded as vaccinated unless a mark is seen. So it comes to pass, that such a patient declaring himself vaccinated is put down as "doubtful," or a "said to be vaccinated." We see now why this class is of heavy fatality. It receives the doubtful bad cases, but never any doubtful mild ones. This is further confirmed by a reference to the most fatal cases of all, the "malignant." In these the skin is not degraded as it is in the confluent; the eruption is suppressed, and the blood poisoned. But the vaccination marks show. From several reports of medical super-intendants, I have collected 661 of these very fatal cases. In only 8 cases were there "doubts." The rest yield: vaccinated, 486 persons with 432 deaths; and un-vaccinated, 167 persons with 150 deaths. Nothing more damaging to vaccination could be recorded. Yet in a purely age table; or in a table of vaccinated and un-vaccinated, without reference to the state of the skin, all this is buried. We see then that in the mild cases, error as to classification is very unlikely ever to occur. In these no deaths need be feared, except from complications. In the malignant also, the classification is not likely to err ; but in very few hospitals is this table given. In the class midway between these, the errors arise. Here the skin is dreadfully affected, and the errors will be numerous; and it is difficult to see how any errors can be made except in favor of the vaccinated. In this middle or confluent class, lie nearly all the doubtful cases. It is therefore imperative, that we should have a reclassification of all our hospital Small-pox. The tables should be three in numberof mild, confluent, and malignant Small-pox. And the patients ranged under them in age, and with full credence to testimony of patients and friends, as to the vaccination or non-vaccination of the sufferers. With these materials, a series of authentic facts as to the incidence of the disease would soon be available. At present, we appear to be too much at the mercy of whims and fancies, as to the classification of Small-pox. I may here mention a kindred matter. Chickenpox, as is well known is not a fatal disease; yet so loath are medical men to return vaccinated children as dying of Small-pox, that we find now numerous deaths returned as due to Chickenpox. It should, no doubt, be vaccinated Small-pox. The last issue of the Registrar-General thus, [p. xiii.,] refers to this: "The deaths ascribed to Small-pox in 1886 numbered 275, and were far lower in proportion to the population than in any previous year. There were, however, also 93 deaths ascribed to Chicken-pox; and as this ailment is rarely, if ever, fatal, in all probability most or all of these deaths were really due to Small-pox." I greatly regret that DR. WALLACES health has been so poor as to have prevented his editing this reprint. He has, however, looked over the proofs, and concurs in the emendations and notes which appear in this edition. Sir,--While thanking my friend Mr. Alex. Wheeler for his too complimentary references to the little I have done for the cause of freedom as regards the tyranny of the Vaccination laws, I wish to make a remark as to one portion of his article which conveys an erroneous impression. Mr. Wheeler says that he could not agree with my conclusion that "Vaccination may have caused more deaths than smallpox itself." This I am not surprised at, because I do not myself accept such a statement, which is certainly not mine. My words, carefully chosen, are--"an operation which has admittedly caused many deaths, which is probably the cause of greater mortality than smallpox itself"--and I call attention to the change from the past tense in the first part of the passage to the present tense--"is probably the cause"--in the latter part. This clearly means, not that "Vaccination may have caused more deaths than smallpox"--as Mr. Wheeler states it, without any limitation of time, which would of course be an absurdity--but that, at the present time, as the result of general Vaccination for about fifty years, it may now be the cause of more deaths than smallpox. This conclusion is drawn from the table of the steadily-increasing mortality from certain inoculable diseases (page 24 of my pamphlet), which increase, in thirty years (1850-1880), was 357 per million (an increase which has continued since), while the deaths from smallpox have not, for many years, averaged more than one-fifth of this amount. If, therefore, only one-fourth part of the large and steady increase of these diseases is due to Vaccination, then my belief that Vaccination is now the cause of greater mortality than smallpox itself is fully justified; and in the contention that this is "probably" the case I do not think that I shall find myself in the minority among the readers of the Inquirer. This indirect effect of Vaccination is further increased by its direct effects, which are now known to be far more terrible, and to produce far greater mortality than was formerly suspected or admitted. I wish to take the opportunity of requesting such of your readers as may have copies of my pamphlet to erase from line 11 on page 21, to line 9 on page 22, 2nd edition (or, in the first edition, from line 8 on page 20 to line 4 on page 21--Ed. V. I. ), as the figures and conclusions therein are erroneous.